In the spring of 2003 I was a first-year novice, aspiring to profess my vows in September of 2004. Each morning, I woke up at 5:45, and, after preparing for the day, I knelt in my cell for an hour of personal prayer. I was a zealous novice, inexperienced in prayer, so it took me a while to learn that meditation is not so much about forcing oneself to think of spiritual things as it is peacefully listening to what God wants to say. Thankfully, the Holy Spirit was there to help me, and He did so through a passage of the Gospel which, to this day, remains my favorite: Christ’s conversation with the Samaritan woman. If you go to John 4, you will find one of the most beautiful dialogues in all four of the Gospels, and perhaps in all of Sacred Scripture. Christ, wearied from His travels, sits by a well in Samaria, and asks a woman who happens to be there to give Him a drink of water. The woman is taken aback that a man should break taboo and speak with her, let alone a Jewish man (the Jews and Samaritans were not on good terms), so she reacts with cold defensiveness. Nevertheless, Christ is not put off by her initial unfriendliness. He gently persists and gradually brings their conversation to a point where she is ready for Truth and He reveals Himself to her as the Messiah. This conversation between Christ and the Samaritan woman fascinated me for two reasons: it helped me understand Christ’s relationship with me, and it helped me understand the relationship I am called to have with the people whom I will touch as a priest. The passage moved me so much that I spent two months reflecting on it during my daily meditations. Fast forward five years and I was a young religious under temporary vows, carrying out a three-year assignment known as “apostolic internship”. My responsibility was to accompany and assist a priest who worked in New York City. Working in that bustling metropolis was my first experience of ministry, and I am grateful to God for all of the lessons that he taught me there. Besides the people to whom I regularly ministered, He gave me many chance meetings with all sorts of fascinating people; I like to think that allowing me these encounters was His way of giving me a first-hand experiences of His conversation with the Samaritan woman. These people whom I met by chance were as varied and diverse as the city itself: struggling homeless, hard-working cops, overworked corporate lawyers, ambitious yuppies, active homosexuals, and recently released convicts, just to name a few. Drawing on my reflection on John 4 during my novitiate, I tried to see each of those people the way Jesus saw the woman at the well. She was not a saint: she had had five husbands, and the man she was living with at the time was not her husband. Yet Jesus saw past all of that: he saw a beautiful woman created in God’s image and likeness, a woman desperately in need of His mercy. The woman is so moved by Jesus, that she goes and brings the whole town to see him. Jesus ends up staying in the town for two days, and although the Gospel is not explicit about this, it is fairly certain that the woman was brought to full repentance and conversion, most likely along with the rest of her village. Being here in Rome, it has been very interesting to watch the media’s reaction to the recent Synod of Bishops on the Family. One journalist described it as being “like a soap opera”, but a friend of mine who worked as a secretary for the synod told me that such characterizations were overblown. There were certainly disagreements, but it was not the an ongoing shouting match some people would have us believe it was. The atmosphere was actually respectful and open, and far from being full of soap-opera-like intrigue. 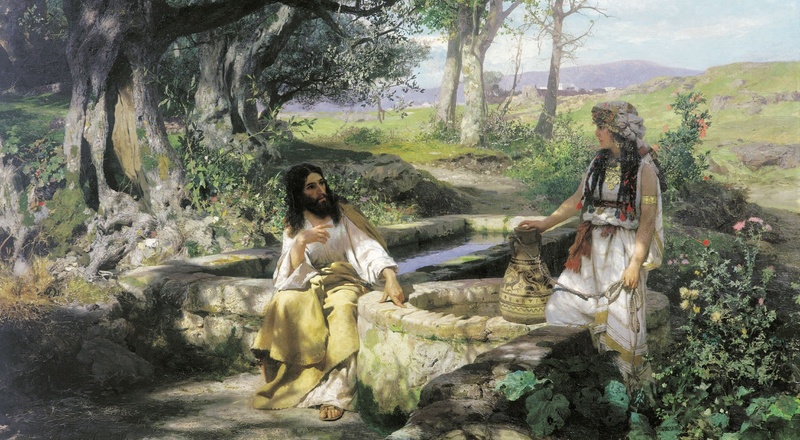 I am still not a priest, nor am I an expert theologian, but I do feel confident enough to say that we should look to Christ’s conversation with the Samaritan woman as a model for for applying both truth and mercy. We must preach the truth fearlessly, but with merciful gentleness that does not harden hearts but opens them. It is up to our bishops, under the authority and guidance of the Successor of Peter, to discern the best pastoral practices for being merciful and truthful with the “Samaritan women” of the world. Between now and the final session of the Synod next October, let us pray for the Holy Spirit to guide them. Gracias por esta reflexión H. Eric. Ha nacido de su corazón moldeado como a la manera del de Cristo. Thank you, Brother Eric, for sharing the beauty and importance of this passage with us. It is clear the Holy Spirit has touched your heart so you can help bring God’s love to His people. Thank you, Virginia! Count on my prayers.